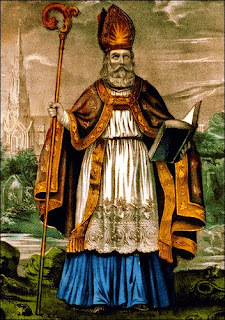 Fighting Irish Thomas: The Saint of "St. Patrick's Day"
The Saint of "St. Patrick's Day"
Come, and from now on, walk with us. Surein' you're all celebratin' today whether you're Irish or just wish ya were. But don't ya think it a wee bit wise to know a little about the man you're all celebratin' over? As with all legendary figures, there are plenty of legends surrounding St. Patrick that need to be sorted out. Truth be told, Patrick probably didn't drive the snakes out of Ireland. But he did even better—he drove the human snakes, the heretics, out, and converted all the rest! And Patrick, well, he wasn't even a native of Erin! Born in the bosom of Ireland's dreaded enemy England, Patrick was kidnapped by Irish pirates as a teen and forced to work as a Shepherd-slave for six years before escaping back home. But as Patrick confessed later, this captivity was to be a blessing in disguise. Faced with hunger, cold and loneliness, Patrick was humbled to the point that prayer became Patrick's sustenance, and God his only companion. By the time a vision in a dream told him a ship was waiting for his escape—nearly 200 miles away—Patrick didn't hesitate. And after landing, the crew (who was a bit unsure about the over-enthusiastic youth to begin with) told Patrick their food was out and challenged him and his God to produce some grub. Patrick proclaimed, "Just turn with faith to the Lord my God, to whom nothing is impossible." Almost instantly, a herd of swine came running by, and while they trapped a few, they came upon wild honey for desert! But alas, not long after Patrick was home safe and sound in his native land with mom and dad, he received his even more famous dream, in which the Irish appeared and bid him to return. After becoming a priest, Patrick did just that, and the rest as they say is history. In his best selling book, How the Irish Saved Civilization, author Thomas Cahill argued that as a missionary, Patrick might have had an even greater impact than St. Paul, for not only did Patrick convert nearly a whole country, he and his monks copied the Bible and preserved Christianity in written form as well to assure the Lord's message wouldn't be lost. While vikings and vandals overran Rome and the rest of civilization, Patrick, by his duel ability to establish both monasteries with permanent monks and inspire missionary monks to preach to the rest of Europe, ensured the faith's survival during a time of constant war and upheaval. And he did so by winning to the faith almost every chieftain in Ireland, some by his courage in the face of torture or death, some by his uncanny knack of relating to and attracting youth (a la John Paul II) and some merely by his humble sense of humor. Patrick, who thought of himself as nothing but an uneducated useless sinner, was constantly amazed by his success declaring, "I am greatly a debtor to God who has bestowed on me such grace that many people through me should be born again to Him." But what Patrick thought a liability was indeed his greatest asset; taught not by men but directly by the Holy Spirit, Patrick's unsophisticated but unwavering faith was irresistible to a country whose simple but hopeful people were always ready for a good story—especially one with a happy ending. About the only dream of Patrick's that didn't come true was martyrdom; Patrick had converted too many beasts as well as chieftains that his desire "that my blood be poured out for his name, and my corpse be torn limb from limb by dogs, wild beasts and fowls of heaven" was not about to happen in his beloved Ireland. Instead, it was his soul that spread to every corner of the earth; as Butler's sums up, "Wherever Irish missionaries have gone, they have taken with them devotion to the apostle or Ireland." And now as my own three sons, Patrick, the engineer, John, the actor, and Gary, the Navy man, are setting out on their own as today's saint did so long ago, I ask that he be with them on their various journeys—and they always return with tales of love, laughter and conversion. Note to self: ask for intercession from St. Pat re:faith.